If you don’t want to pay too much attention to what you are eating, try this easy cucumber diet. With it, you can get significant results in just a week or 10 days at most. All you need are a few specific products to eat and be physically active at all times. So, the main ingredient for this diet is a cucumber. You can eat it in unlimited amounts in your meals, but most importantly, you can consume it whenever you feel really hungry. Plus, it is good for your entire body because it stimulates the metabolism, purifies the organism, helps with the digestion and cleanses intestines. 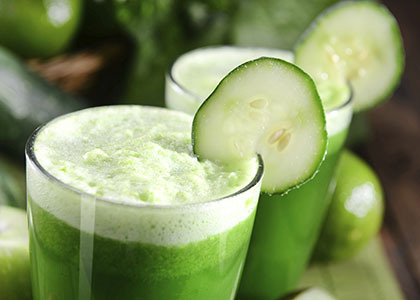 Moreover, the cucumber can help the body get rid of the excess water, especially if you consume it on a daily basis. It can be perfect for a full detoxification, removing acne and cleansing the entire skin on the face. No wonder why a lot of face masks contain cucumber. Start this cucumber diet by following this meal plan. Purchase a low-fat yogurt with no added sugars and add 200 g of sliced cucumbers. Mix them well. If you still feel hungry, you can slice two peaches or one apple and eat them. Start by boiling the potatoes or baking them, your choice. Eat them with some slices of whole wheat bread and a sliced cucumber. Later as a snack, you can cut up some fresh fruits and make a fruit salad. Also, for a drink, you can consume coffee or tea but without any sugar. Whether you choose potatoes or bread, it is up to you, but you can eat either of them with some tuna and a sliced cucumber. Besides, if you dislike the taste of tuna, grill the white meat without oil and eat it with some boiled eggs. Start by adding the apple, cucumber, and spinach to a blender and blend them well. But, do not peel them. After that, add some ginger and continue blending. After you get the desired consistency, your shake is ready. Decorate your glass with some walnuts and almonds and drink it immediately. If you let the drink rest, it might lose its healing properties. Besides, it is rich in minerals and vitamins such as Vitamin A, magnesium, fiber, Vitamin K, Vitamin C, calcium, Vitamin B, iron, Vitamin E, etc. For dinner you won’t need to eat many different foods, you will only need 300 g of any fruit you like and make a fruit salad. If you want the best results for only 7 days, you will need to focus on a more rigorous diet. For breakfast, eat only the yogurt with 200 g cucumbers and fruit. For lunch, eat only a large plate of cucumber salad with a piece of dried bread. While for dinner you must eat only a fruit salad.